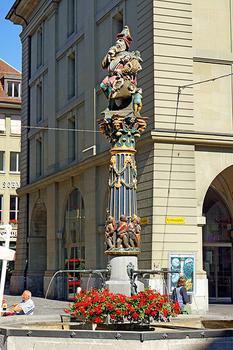 The Child Eater Fountain, Kindlifresserbrunnen, is a stupefying 16th century sculpture by Hans Gieng. The Child Eater Fountain, Kindlifresserbrunnen, is a stupefying 16th century sculpture by Hans Gieng. It depicts an ogre devouring a child, while 4 other kids precariously hang from the sack bag in his right hand. The frieze around the pedestal's base depicts armed bears going to war, including a piper and a drummer.